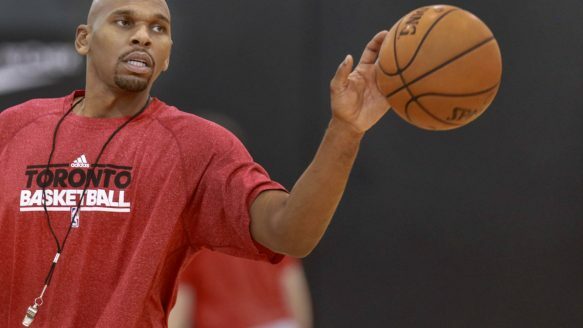 At a time when NBA players can basically exit the court, shower, throw on a suit and become a head coach, Jerry Stackhouse is taking the longer route. After an 18-year career as a player that pulled him through eight teams and 970 games, the two-time all-star is three weeks into a new life as a Raptors assistant coach, working under Dwane Casey. The 40-year-old is active on the court every day with the Raptors, often working with the guards and never shying away from putting his six-foot-six, 218-pound frame into drills to add some game-like physicality for his players. He still has that somewhat unorthodox squat in his shooting stance, his left hand still uncomfortably drifting in front of the ball on its release. Even if it looked like it shouldn’t have worked, it did. He scored 16,409 points in that long career and he’s banking on that, plus his winding journey as a player to help him act as a bridge of sorts between Casey and the players. “I’ve been in their shoes,” Stackhouse said, with a retro pair of Filas on his feet, a throwback to when he had his own shoe in the mid-1990s. With the pre-season coming to an end, it’s far too soon to try to evaluate anyone’s impact, but Stackhouse is working hard in a way that he’s never had to before to create his spot on the coaching staff and within the organization. He might assert himself more with Joseph, who’s never been a starter and is still just 24, than with shooting guard DeMar DeRozan, who’s been an all-star and is in his seventh year in the league. Casey knows Stackhouse well, having worked with him as an assistant with the Dallas Mavericks in the 2008-09 season. Joseph feigned remembering a time when Stackhouse played, making “he’s so old” jokes after Sunday night’s win over Cleveland and again on Monday, but he’s appreciating the time with his new coach. An aggressor his entire career, Stackhouse is adapting as a coach. He frequently mentions the value in observing. He admits that he would have jumped at the opportunities that Jason Kidd and Derek Fisher were afforded in Brooklyn and New York, respectively, quickly moving from players to coaches, but he’s happy to be where he is right now. “I would have loved to have coached the Brooklyn Nets. That was a team I knew very well. I think I was better prepared because I‘d been coaching AAU basketball for three or four years,” he said. “But everyone’s path is different. Now that I’m actually in it, I don’t think I was necessarily as ready as I could be, if I’d just learned a little more and observed more. We have two ears and one mouth, it’s put to him, and he laughs. “Two ears, one mouth. Two eyes and one mouth,” he said.